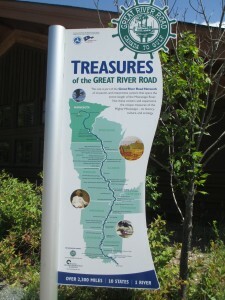 If you want to get a feel for what it means to be America’s great river, travel it via the Great River Road. Great River Road display in Itasca State Park, the Mississippi River headwaters. We didn’t do the whole thing, but we got a taste in October when we meandered four of the five Minnesota sections. The breadth of the scenery and disparity of lifestyles were a microcosm of the state and, I suspect, the nation. It was a way to think about the country – just before an election – and take a measure of the River’s mysterious connection to American life. So it is today that we have, in most of the 10 Mississippi River states, active Mississippi River Parkway Commissions and a national body as well. Dedicated to promoting tourism, they strive to meet the criteria of the federal guidelines with marked routes, highlighted destinations, printed background material and a web site. In most states, they work with other state agencies such as the highway departments and the historical societies to make the river accessible and to inform the public of its significance. Taking advantage of this guided experience goes beyond visiting specific locations and tourism though. Traveling the Great River Road, like traveling rivers everywhere, gives authentic glimpses we seldom can see from interstates or in the miniscule media clips on TV or the internet. That we weave together our lives at all is still a testament to the human inclination to live in society and to make it good. And, the Great River Road shows us how the Mississippi River has been and continues to be at the heart of that quest. This entry was posted in Culture and History, Economic, Environment, Uncategorized and tagged FDR, Great River Road, Harold Ickes, Minnesota Great River Road, Mississippi River Parkway Commission. Bookmark the permalink. rosostrov.ru on How is the Mississippi River Like a Puzzle Box Cover?